Senegal coach Henri Kasperczak has included striker El Hadji Diouf in the squad to face Guinea on Sunday despite the player announcing his retirement from international football. Diouf made the announcement on a Senegalese radio station on Monday, citing the continued organisational problems with the Teranga Lions. Kasperczak said: "I understand the player. "Not only is he the captain of the team and so must sometimes mark his territory, but he also wants others to face up to their responsibilities. "I can do nothing to force him but what I can do is talk to El Hadji because this issue is in the interest of the Senegalese nation. "He is a model within the squad and in any case, since I have been coach of Senegal he has never let me down, he has always behaved nobly. "Frankly I don't understand what has motivated his decision, but I do believe that only discussion can change things, especially as the player is so well loved by the Senegalese public. "We know all about his contribution on the pitch. El Hadji has always drenched his jersey [with sweat] for the well-being of the team. 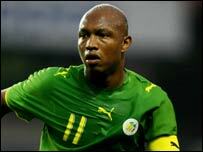 "It is always a sense of pride for Diouf to wear the national colours." Diouf also threatened to stop playing for the Teranga Lions in the wake of the 2002 World Cup finals when coach Bruno Metsu quit as the Senegal coach. Returning to the squad for the first time under Kasperczak are Souleymane Diawara of French side Bordeaux and Abdoulaye Faye of English Premier League club Newcastle United. Both players had been excluded from previous squads following disciplinary problems under Senegal's previous coach Abdoulaye Sarr.